A new pair of boots. Size 9.5B. Width: 4 1/4". Heel to toe: 12". Ralph Lauren Polo Eldin Leather Engineer Boot. The waxed leather sourced from one of the oldest tanneries in the United States and hand-distressed details give this engineer boot a rugged Polo look. RRL Ralph Lauren Suede Powell Brown Boots. Light brown suede. Size 9.5 D.
POLO RALPH LAUREN TEAM USA 2010 OLYMPIC BOOTS 9.5 EU 43 NEW RARE MUST HAVE !!!! 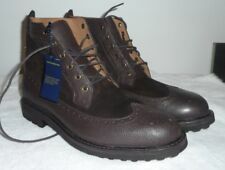 preowned ralph lauren leather Polo Boots. Condition is Pre-owned. Shipped with USPS Priority Mail. FOOTWEAR CONDITION CHART. NOTE : DUAL STEEL FRONT ZIPPERS FOR EASY ON & OFF. 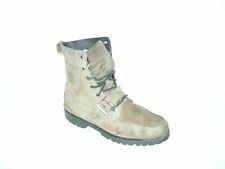 MATERIAL : LEATHER / LIGHT INSULATION / STEEL ZIPPERS / LUG RUBBER BOTTOM OUTSOLES. COLOR : BLACK. DON'T MISS OUT ON THIS DEAL! This is a great pair of boots by Polo Ralph Lauren. Brown and Black. Logo on buckle and side of boot. Water repellent. Polo Ralph Lauren. One of the lace hooks on the left boot, inside is missing (see photos) not really noticeable when worn, your pants would cover it and it is on the inside that isn't seen as much.